The five major metropolitan areas in Texas account for nearly 70 percent of total nonfarm employment--Houston, Dallas, Ft. Worth/Arlington, San Antonio, and Austin. Twenty-one smaller metropolitan areas account for another 20 percent of total employment with the remaining 10 percent scattered throughout the rest of Texas. Full Source: Current data are available from the Federal Reserve Bank of Dallas (FRBD), http://www.dallasfed.org/data/hotstats/txempl.html, accessed 15 July 2005. A longer report using 2001 data from the Dallas Fed is at http://www.dallasfed.org/eyi/regional/0101.html, accessed 15 July 2005. All local area employment data was originally compiled by the Bureau of Labor Statistics (BLS), http://www.bls.gov/lau/home.htm. Full Footnote: Employment figures for each region are averages of data for Texas metropolitan statistical areas (MSAs) for the first four months of 2005. We follow the Dallas Fed's practice of grouping smaller MSAs for reporting purposes. 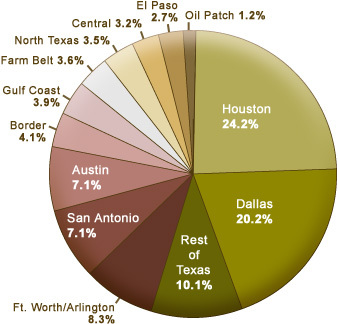 Regions featured in the pie chart and the MSAs they include are as follows: Houston-Baytown-Sugar Land MSA; Dallas-Plano-Irving MSA; San Antonio MSA; Ft Worth/Arlington MSA; Austin-Round Rock MSA; Border: Laredo MSA, Brownsville-Harlingen MSA, and McAllen-Edinburg-Pharr MSA; Central: Waco MSA, College-Station-Bryan MSA, and Killeen-Temple-Fort Hood MSA; Farm Belt: Abilene MSA, San Angelo MSA, Amarillo MSA, and Lubbock MSA; Gulf Coast: Beaumont-Port Arthur MSA,Corpus Christi MSA, and Victoria MSA; North Texas: Texarkana MSA, Longview MSA, Tyler MSA, Sherman-Denison MSA, and Wichita Falls MSA; Oil Patch: Midland-Odessa MSA.